NEW YORK -- The S&P 500 suffered its biggest drop since late September on Thursday as the European Central Bank disappointed market hopes for greater stimulus. The ECB move triggered a spike in the euro that caught investors by surprise, forcing them to shift positions that hit most asset classes. Bond prices dropped after the announcement. At the same time, the CBOE Volatility index, the stock market's fear gauge, jumped 13.8 percent, closing at its highest since Nov. 17. %VIRTUAL-pullquote-The biggest influence was the [ECB President Mario] Draghi talk this morning; it didn't satisfy the U.S. markets.%The ECB cut its deposit rate deeper into negative territory and extended its asset buys by six months, as expected. But some market participants had hoped for greater stimulus. All 10 S&P 500 sectors fell in a second day of sharp losses for U.S. stocks. Health care ended down 2.2 percent, leading the day's decline in the S&P 500, followed by energy, down 2 percent. "The biggest influence was the [ECB President Mario] Draghi talk this morning; it didn't satisfy the U.S. markets," said Peter Tuz, president of Chase Investment Counsel in Charlottesville, Virginia. Federal Reserve Chair Janet Yellen's comments suggested the Fed was on track to raise interest rates this month. Yellen told lawmakers the U.S. central bank was close to lifting its overnight interest rate from near zero. She gave an upbeat view of the economy, saying "growth is likely to be sufficient over the next year or two to result in further improvement in the labor market." The Fed's next policy meeting is on Dec. 15-16. 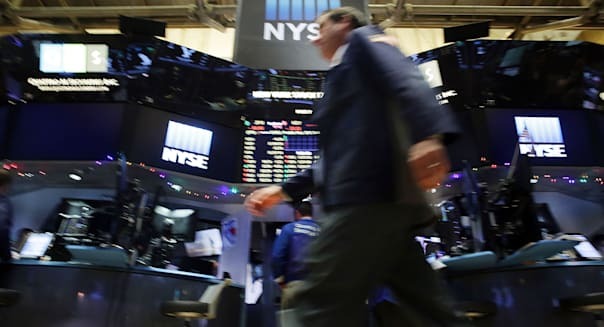 The Dow Jones industrial average (^DJI)​ fell 252.01 points, or 1.4 percent, to 17,477.67, the Standard & Poor's 500 index (^GSPC)​ lost 29.89 points, or 1.4 percent, to 2,049.62 and the Nasdaq composite (^IXIC)​ dropped 85.70 points, or 1.7 percent, to 5,037.53. The S&P 500 posted its biggest daily percentage decline since Sept. 28 and closed at its lowest since Nov. 13. Some of the selling was related to leveraged funds that were likely forced to close positions as volatility spiked. According to Bank of America (BAC) research, these funds, which were heavily involved in the dramatic selloff in late August, have since returned to the level of leverage they had prior to that downturn. Volume was elevated in S&P 500 index options expiring on Friday, particularly in put options that suggest people were hedging against the possibility of losses, said Henry Schwartz, president of options analytics firm Trade Alert, in New York. "After a really slow week it does look like hedgers are taking some action today," he said. Data released Thursday showed initial U.S. jobless claims for last week rose but remained at levels consistent with a strengthening labor market. Friday's employment report is expected to show the U.S. economy added 200,000 jobs in November. Zafgen (ZFGN) shares were down 5.1 percent at $5.96 after the company said the U.S. Food and Drug Administration was putting on complete hold a late-stage study testing its experimental obesity drug. Declining issues outnumbered advancing ones on the NYSE by 2,518 to 579, for a 4.35-to-1 ratio on the downside; on the Nasdaq, 2,159 issues fell and 674 advanced for a 3.20-to-1 ratio favoring decliners. The S&P 500 posted 9 new 52-week highs and 26 new lows; the Nasdaq recorded 53 new highs and 78 new lows. At 8:30 a.m. Eastern time, the Labor Department releases employment data for November and the Commerce Department releases international trade data for October.